Instead of making a snowman from three balls of snow, use bins or boxes instead. Then find the volume. Start by finding suitable cardboard boxes or bins. I chose two plastic bins, and a rectangular laundry basket lined with a garbage bag. Here are photos of the bins. Notice that the smaller bin stacks nicely on top of the larger one. Pack the boxes or bins with snow to make blocks. Stack them. Make sure that the snow is packed tightly. invert the boxes or bins to take out the snow. 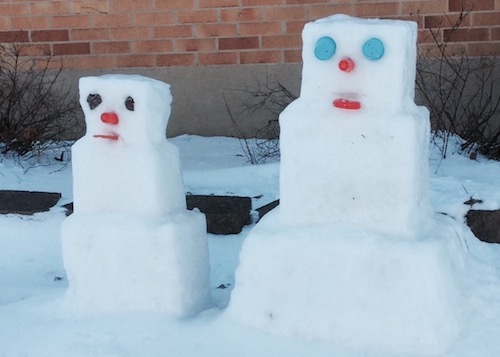 Stack the snow blocks and add a face such as the ones shown below. I used the laundry basket plus two bins to make the snowman at the right. Then I used the same bins for the bottom two parts of the snowman on the left and then shaped a smaller block for the head. The laundry basket was about 18 by 12 by 11 inches, Thus, V = 2,376 cubic inches. The larger bin was about 12 by 8 by 11 inches. So, V = 1,056 cubic inches. The smaller bin was 8 by 6 by 6 inches. So, V = 288 cubic inches. Add to find the total volume. It's about 3,720 cubic inches. What other questions can you ask students? 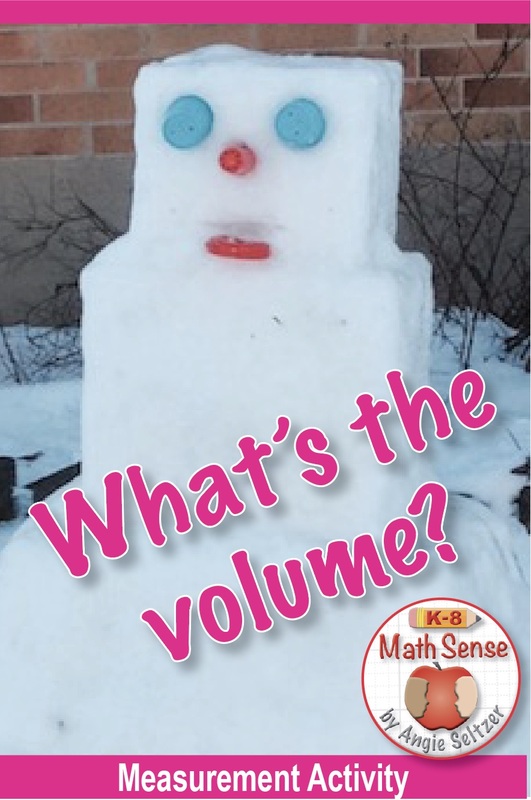 What is the total height of the snowman? What is the perimeter of the base? the top? Thanks for visiting my blog! Get a free card set for understanding volume today by signing up for my monthly newsletter. Visit the Freebies page to see other subscriber freebies and to sign up. What are the CORE Math Goals?